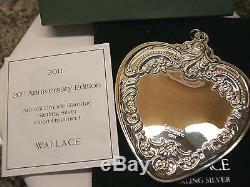 Wallace 2011 Annual Grande Baroque Sterling Silver 20th Edition Heart ornament is offered for sale. This heart has never been out of the box nor has it been used. It has the original ribbon (red and white) that has not been attached; green felt bag and original box along with the information on the heart. The information states, Featuring a special design created for this ornament, the elegant Sterling Silver Heart is a perfect addition to your tree or mantel. This annual edition ornament is the 20th in this collectible series and will not be repeated. It is really a treasure. Back and front of the heart are shown on the first two pictures. The third picture shows you the original signature. If you have any questions, please let me know. 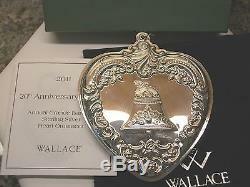 The item "WALLACE 19TH ED. 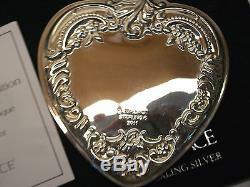 2011 HEART & BELL ORNAMENT-GRANDE BAROQUE STERLING SILVER-BOXED" is in sale since Sunday, May 26, 2013. This item is in the category "Collectibles\Holiday & Seasonal\Christmas\ Current (1991-Now)\Ornaments\Other Current Tree Ornaments". The seller is "sj_treasures" and is located in Montgomery, Alabama. This item can be shipped worldwide.